Q: The Korean Central News Agency (KCNA) said today that the DPRK has successfully test-fired a Hwasong-15 intercontinental ballistic missile (ICBM) earlier this morning. What's China's comment? A: The UN Security Council resolutions have clear stipulations about the use of ballistic missile in the DPRK's launching activities. 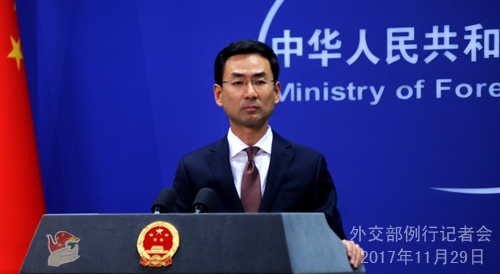 China expresses grave concern and opposition to the DPRK's launching activities. 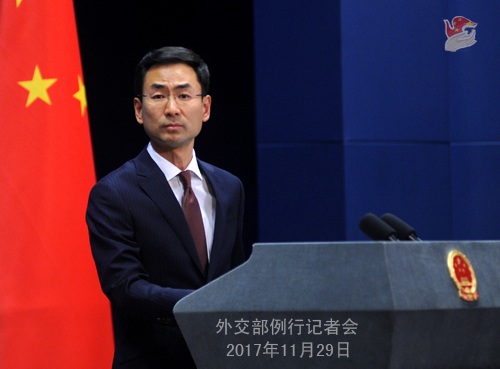 China strongly urges the DPRK side to abide by relevant Security Council resolutions and cease actions that will heighten tensions on the Korean Peninsula. We hope that all relevant parties will act cautiously and work together to safeguard peace and stability in the region. Q: Is China willing or preparing to increase sanctions on the DPRK? A: Firstly, China always fully, accurately, earnestly and faithfully implements Security Council's DPRK-related resolutions and fulfills its due international obligations. Secondly, we will continue to handle the relevant issues in a way that helps to realize denuclearization of the Korean Peninsula, advance dialogue and negotiations and safeguard regional peace and stability. Q: Last week Minister of the International Department of the Central Committee of the Communist Party of China (CPC) Song Tao visited the DPRK. How was the communication on the missile and nuclear issue between the two sides going on? Did the DPRK inform China of the missile launch in advance? A: Minister of the International Department of the CPC Central Committee Song Tao visited the DPRK as the special envoy of General Secretary Xi Jinping mainly to brief on the 19th CPC National Congress. During the visit, the two sides exchanged views on the relations between the two parties and countries as well as other issues of mutual concern. We have released the information on the relevant information. 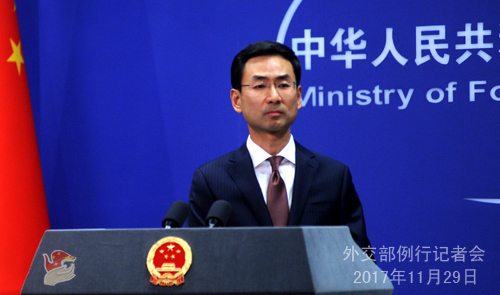 The DPRK knows very well about China's position on the Korean Peninsula nuclear and missile issue. Q: Lee Ming-che was sentenced to five years in jail for "subverting state power". The US and the EU have called on China to release him at an early date so that he could be reunited with his family. How do you respond to that? A: The spokesperson with the Office for Taiwan Affairs of the State Council already gave a fairly adequate response to this question. I would like to stress that China is a country governed by law, and we hope relevant parties will respect China's judicial sovereignty rather than interfere in China's internal affairs. Q: First Question, US Senator Lindsay Gram said in a CNN program that he hoped the DPRK regime would be clear that if President Trump had to choose between the destruction of the DPRK regime and that of the continental US, he would go for the former. China is also hoped to be aware of that. What's your response to this? Second, will China provide more information on former US President Barack Obama's meeting with President Xi Jinping? Will the Korean Peninsula nuclear issue come up in their talk? A: On your first question, China is always committed to the denuclearization of the Korean Peninsula, the peace and stability of the peninsula and the settlement of the issue through dialogue and negotiation. As we stressed time and again, resorting to military means and use of force is not an option for the settlement of the Korean Peninsula nuclear issue. With regard to your second question, former US President Barack Obama is now in China. Yesterday he was in Shanghai for the annual Global Alliance of SMEs Summit and he will attend activities in Beijing. We will let you know if we have further information on whether he is going to meet with President Xi Jinping. Q: According to unverified overseas media reports, during the Syrian President's adviser's recent visit to China, China agreed to send off its snow-leopard anti-terrorism special forces to fight the East Turkestan Islamic Movement (ETIM) militants in Syria, I wonder if you can tell us if those reports are true? A: Last week, Foreign Minister Wang Yi met with Syrian President's Political and Media Advisor Bouthaina Shaaban in Beijing and the two sides exchanged views on the situation in Syria. The Chinese side has issued a press release and I have no further information to offer. I have not heard about what you mentioned regarding China's sending off its snow-leopard special forces to Syria. Q: At a press conference held after the China-France foreign ministers' talks last week, the French foreign minister said that he did not believe China's "suspension for suspension" proposal is an effective way out. Today, Japanese Prime Minister Shinzo Abe also said at parliament that the proposal was wrong. What is China's comment? 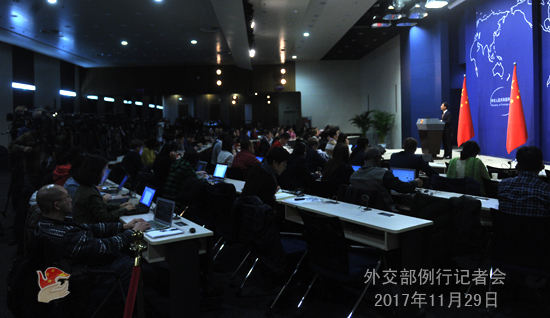 A:Regarding French Foreign Minister Le Drian's visit to China last week, press release has already been issued by the Chinese side. As far as I know, he exchanged views with Foreign Minister Wang Yi on the Korean Peninsula nuclear issue and the current situation on the Peninsula. The French side showed understandings towards China's "suspension for suspension" proposal. China has always stressed that the "suspension for suspension" proposal is the most viable and sensible solution available. We hope that all parties involved will display sincerity and flexibility in order to ease tension and come back to the right track of settlement through dialogue and consultation. Q: We have noticed that when meeting with Political and Media Advisor to the Syrian President Bouthaina Shaaban, Foreign Minister Wang Yi proposed three focal points for solving the Syrian issue in a new stage. The Special Envoy of the Chinese government on the Syrian issue Xie Xiaoyan is currently in Geneva for the eighth round of Syria peace talks. Apart from that, Ambassador for China-Arab States Cooperation Forum Affairs of the Chinese Foreign Ministry Li Chengwen and Director-General of the Department of West Asian and North African Affairs of the Foreign Ministry Deng Li are making contact with relevant parties in the region. Apparently, China is making intensive efforts to reach out extensively to other parties for hot-spot issues in the Middle East. Would you tell us why is China making such efforts? A: The world could not be a tranquil place if there is instability in the Middle East. At present, the situation in the Middle East is at a crucial juncture. The attention of the international community has been drawn to issues in this region ranging from anti-terrorism to promoting peace and from economic transformation to social reform. As a permanent member of the UN Security Council, China always concerns itself with the peace, stability and development of the Middle East region. We hope that when approaching regional hot-spot issues, all parties concerned will stick to the direction of political settlement, and find an inclusive solution that is compatible with the reality of the region and accommodates the interests of all parties through dialogue and consultation. In this process, the UN's role as the main channel of mediation must be brought into full play, while the voice of regional countries must be fully taken heed to. Too many people in the Middle East are suffering at the brutal hands of terrorists. We support regional countries in forming synergy, consolidating the momentum of anti-terrorism and striving to restore regional stability and order. We support countries in the region in exploring a development path suited to their national conditions and are ready to share governance experience and jointly build the Belt and Road and promote peace and stability through common development. Q: Would you give us more details on Myanmar's State Counselor and Foreign Minister Aung San Suu Kyi's upcoming visit to China? A: I have answered similar questions in the past couple of days and I have no more information to offer. Q: The Canadian government has said that they plan to hold talks after Christmas with around a dozen or more foreign ministers regarding the DPRK situation. I'm wondering is China is going to attend those talks in Canada? A: I am not aware of the information you mentioned. As it is well known to all, China's position on the issue of Korean Peninsula is clear and consistent. Given the complexity and delicacy of the current situation, we hope all parties concerned will step up efforts to ease tension and bring the Korean Peninsula issue back to the right track of settlement through dialogue and consultation. Q: The Communist Party of China (CPC) in Dialogue with World Political Parties High-level Meeting will kick off tomorrow. Will the Workers' Party of Korea be present? A: I don't have the relevant information. You may refer to the organizers. Q: You said before that the China-DPRK friendship bridge has been closed. Is it reopened now? A: I responded to this question before. As we understand, the China-DPRK friendship bridge will be closed temporarily for repair work on the bridge floor by the DPRK side. It will be reopened after the repair is finished. As for the current status of the bridge, I will try to get more information and come back to you later. Q: The US launched a new anti-dumping case yesterday against Chinese aluminum producers, using a very aggressive tactic. Does China have any comment on the latest anti-dumping case? A: China-US economic and trade relationship is a mutually beneficial and win-win one in essence. China is ready to work with the US side to continuously deepen economic and trade cooperation, properly manage differences and promote economic relations and trade so as to deliver more benefits to people in our two countries. In the meanwhile, in response to this case specifically, I shall stress that we hope the relevant countries will honor their commitments and follow Article 15 of China's Protocol of Accession to the WTO, that is, WTO members must end the "surrogate country" practice in anti-dumping investigations against China by December 11, 2016. Q: The UN Security Council will hold a meeting to discuss the latest missile launch by the DPRK. If the US proposes to impose unilateral sanctions on the DPRK bypassing the UN, what will be China's response? A: China's position is unequivocal. We always disapprove of any unilateral sanctions or "long-arm jurisdiction" outside the framework of the UN Security Council imposed on others by a certain country in accordance with its domestic law.